Chiara Zuccolotto is California designer; well acquainted to the Niche markets of the Fashion world she launched her first company in 2013. Since then Zuccolotto has expanded across the United States and into Europe. Chiara is known for having the finest fabrics and the creating perfect silhouette. After being invited to Paris last summer, Chiara studied under the worlds best couturier teams including Balenciaga, Madame Gres last living students and Dior and worked with designers such as; Tony Ward, Galia Lahav, Ziad Nakad during Paris Fashion Week. Upon her return to the United States Chiara has moved into expanding her couture designs and keeping the Art of true fashion alive. Dawnamatrix has been expanding the reach of latex fashion world wide. Just last year, Ben and Dawn won the Wearable Technology Award at the preeminent design competition in New Zealand's World of Wearable Art. Dawnamatrix has been worn by celebrities like Beyonce, Katy Perry, Sharon Stone, Kylie Jenner, and many others. Their many publications include Vogue, Interview Magazine, WWD, and Billboard. The collection will feature new eye-popping laser cut designs to accentuate the body with graphic bursts of color. Jersey Virago is a Seattle swimwear company founded in 2010 by self taught designer, Meagan Kruz. Mixing bold geographic lines and compelling textures, her designs grab the eye and make a statement. Jersey Virago has been seen in British Vogue, British GQ, and on the television show Americas next top model. The Future Looks Fabulous! Lumen Couture provides high-end fashion technology dresses for everyday wear, special events, and performers. Each garment is designed by seasoned FashionTech designer Chelsea Klukas, who is the co-founder of the internationally-acclaimed fashion technology organization MakeFashion. With MakeFashion, Klukas has produced 6 years of runway fashion shows over the world and has produced of over 100 fashiontech garments. MakeFashion also contributes to introducing young girls to STEM through hands-on education in creating wearable tech fashion. 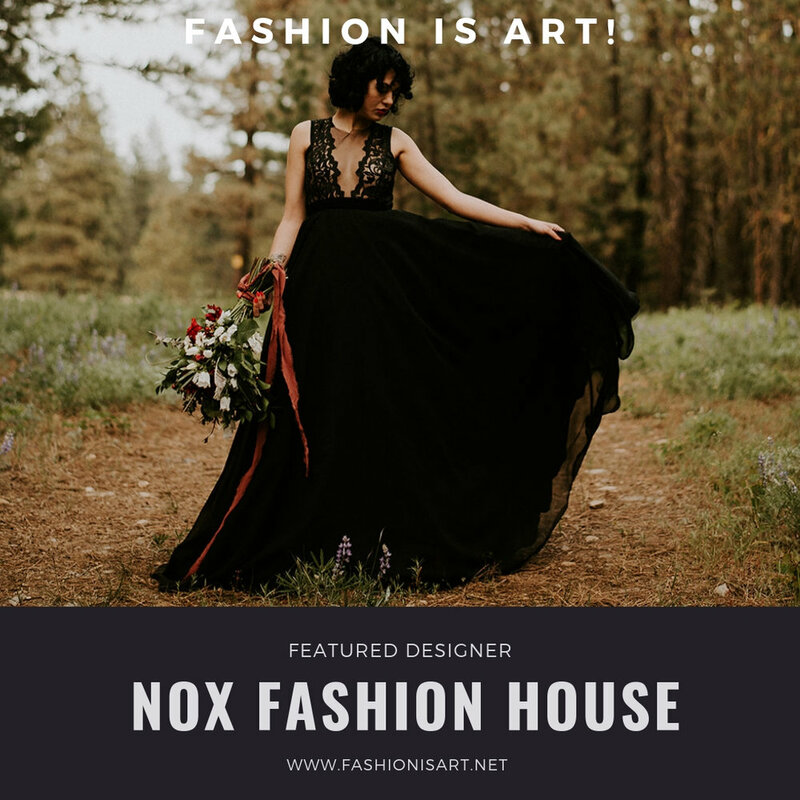 Nox Fashion House was founded in 2017 by Avi Hart. Avi is a self-taught designer and seamstress with a background in modeling, and aims to disrupt the local fashion scene with her edgy fashion aesthetic. Each piece is hand-crafted, featuring unique textiles, dramatic silhouettes and figure-flattering tailoring. Stone Crow Designs is a luxury eco-conscious, slow fashion brand. She specializes in stylish comfortable clothing that can be worn from day into night. Her style is called Modern Goth with a nod to classic design, technique and a bit of rock in roll. She uses organic, sustainable, vintage, dead stock and up-cycling products. As well as hand dying or use screen-prints when possible, which helps create our own unique look. Sloane White is a contemporary couturier living and working out of downtown PDX. White’s collections are fabricated from one hundred percent reused and reclaimed materials found locally, using items such as broken costume jewelry, chandelier pieces, to trash items such as stirring straws.